Wow – could we really fit anything more into one weekend? 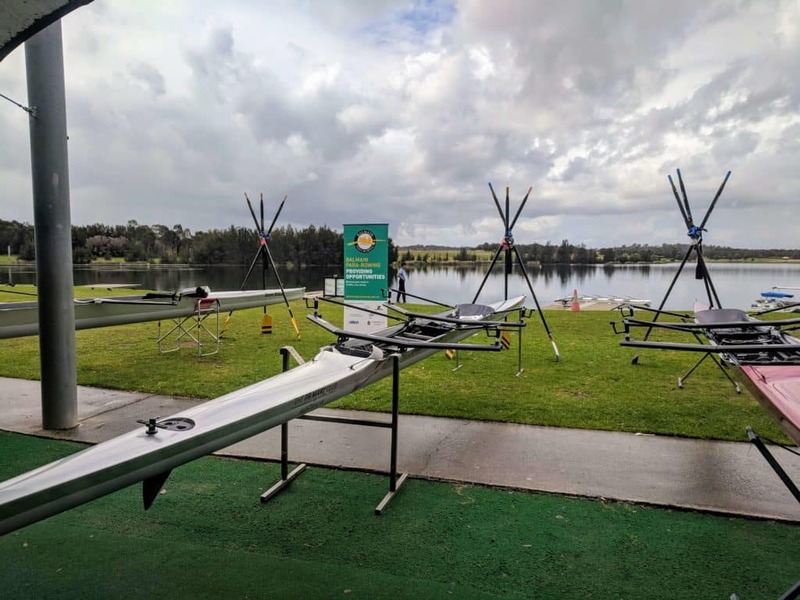 Last weekend the Para Program raced 9 crews at the Spring Regatta, ‘springing’ into action with 24 premiership points at the first regatta of the season. However, not wanting to rest on our laurels, we also ran a training camp and christened not one, but FOUR new boats for the program! Seven new para athletes took part in the training day, having been identified by Rowing NSW and the program at a recent ‘try-out’ day run by the Australian Paralympic Committee. Those athletes joined over a dozen BRC para rowers in an all-day training session the day after the Spring Regatta.Although the weather certainly challenged all participants, it did nothing to dampen the spirits of the rowers who made good use of Rowing NSW’s para-Barge, the Melissa McCormack (named after Rowing NSW’s former Finance Officer), to learn the finer points of sweep oar rowing. The rowers were also put through their paces in a land-based session on rowing machines, and were given the chance to row down part of the Olympic course. The existing members of the program worked in with the new recruits, cumulatively clocking up dozens of kilometers of rowing in all classes of boats from PR1 single sculls, up to a PR3 4+, which saw former Paralympian and Australian Rowing Team member Jeremy McGrath make his hotly anticipated return to the sport. Keep a look out for Jeremy crossing the finish line in both para and non-para crews at upcoming regattas this season! The program finished off the day with a boat christening, introducing four new boats for the use of the para-rowers, including the ‘Jeremy McGrath,’ a top spec coxed four from Resolute Racing in the USA, as well as two pair/doubles, the ‘Anne Craig’ and the ‘Primary Club’ (generously donated by the Primary Club of Australia), as well as a Swift PR1 single scull, generously donated by ‘Urban Apartments.’ Look out for these boats on the water over the coming season! The program is continuing to look out for new para-athletes who might be interested in getting onto the water, and is also keen to work with para-rowers from all clubs to put together crews (in both para and non-para events) and to increase opportunities for para-athletes within the sport. Please feel free to contact us if you are interested!